Why is it called "Island of the Witches", read here the legend behind the name. Cayo Las Brujas is a tiny island located off the north coast of Cuba, in the province of Villa Clara. Along with its two neighbors, Cayo Santa Maria and Cayo Ensenachos, it forms a mini-archipelago called “Los Cayos de Villa Clara” (aka Cayeria del Norte); and this little group of island is part of a larger archipelago called “Jardines del Rey” (King's Gardens). These 3 cayos are connected to the main island of Cuba by a 48-km causeway (called Pedraplen). For further information on where Cayo Las Brujas is located and to view maps of the region, please visit our Location $ Maps section. The northern coastline of Cayo Las Brujas is where are located its beautiful beaches, such as "Playa Salina" and "Playa La Manteca", for more information please visit our Beaches section. Cayo Las Brujas is uninhabited (no villages, no cities, no farms). The hotels' employees come to work by bus from the surrounding cities, such as Caibarién, Remedios, Camajuani and Santa Clara. The Cayos of Villa Clara are part of the Buenavista Biosphere Reserve recognized by UNESCO. The Cuban government is recognized to be very environmentally conscious so during the construction of the 48-km causeway, they built a bridge-opening every kilometer to minimize the negative impact of the construction on the local marine life. This connection to the mainland allows an easier access for supplies, but also an easy way for tourists to get off the cayo and explore the region. For further information please visit our sections Sights & Activities and Excursions & Tours (in the "Things to Do/See" item from the top menu), you will then be redirected to our www.cayosantamaria.info website as the activities, attractions and excursions are common to the three cays. There’s a small domestic airport on Cayo las Brujas code MUBR), but the Abel SantaMaria Airport (aka Santa Clara Airport, code: SNU) is the closest international airport to Cayo Las Brujas. For more details on these airports, please visit our Airports section (from the "Plan your Trip" item in the top menu) . The transfer from the Santa Clara airport to Cayo Las Brujas takes approximately 80 minutes (97 km). Transfers by air-conditioned bus are usually included when buying a vacation package. Taxis are also available, or you can rent a car. The first hour or so is through the Cuban countryside and small towns and villages, the last half-hour is on the 48-km causeway with the ocean on both side. At the end of the causeway you'll reach first Cayo Las Brujas, then the delfinario (dolphinarium), followed by Cayo Ensenachos, and finally Cayo Santa Maria. The bus line VIAZUL serves Cayo Las Brujas from downtown Santa Clara, but not from the airport. For further information on how to get to Cayo Las Brujas by air, by car or by bus, please visit the Getting There section (from the "Plan your Trip" item in the top menu). The easiest and cheapest way to stroll around the three three cayos is with the open-top double-decker tourist buses called Panoramic Bus Tour. They stop at every hotel, every pueblo (aka plaza or market) and at the Delfinario; the cost is 1 CUC per ride. The schedule is posted in the lobby of each hotel. Taxis are also available, or you can rent a bicycle, scooter, car or jeep. For further information visit our Getting Around section (from the "Plan your Trip" item in the top menu). All hotels in the three Cayos of Villa Clara are resort-style and All-Anclusive, except for the small Villa Las Brujas 3* and the boutique Hotel Las Salinas Plaza & Spa which include accomodation-only and have a on-site restaurant with very reasonnable prices. Visit our Hotels section for detailed information on each hotel in Cayo Las Brujas (present and future). The Cayos of Villa Clara are also home to a few "pueblos" (aka plazas), They are commercial and entertainement centers offering a wide range of extra services (off-resort) such as: restaurants, bars, discotheque, bowling, boutiques, handicraft markets, spa, etc... 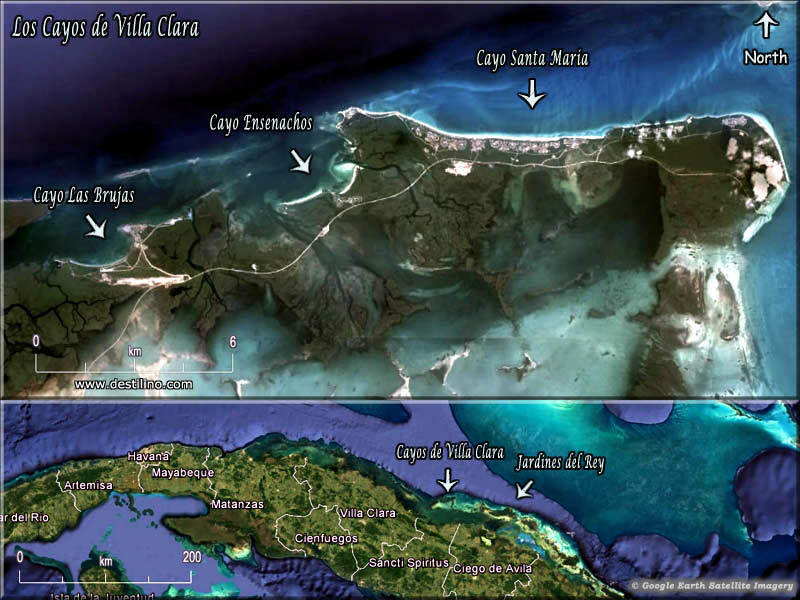 They are Pueblo La Estrella and Pueblo Las Dunas which are located on Cayo Santa Maria. There's 3 of them on Cayo Santa Maria: Plaza La Estrella, Plaza Las Dunas, and Plaza Las Terrazas. There's one on Cayo Las Brujas: Plaza Las Salinas. "Las Brujas" means The Witches. Cayo Las Brujas takes its name from an old legend about a young couple whose love was thwarted by a jealous uncle. The superstition has it that the girl was a witch and that she used magic to transform herself into an owl and disappear to escape from her uncle. Other stories are that noises, apparitions and ghosts were being heard and seen at that time in one part of the island.